Four steam generator tubes made in inconel (conductivity of 1 MS.m-1 and a relative permeability of 1) are inspected with a bobbin probe. 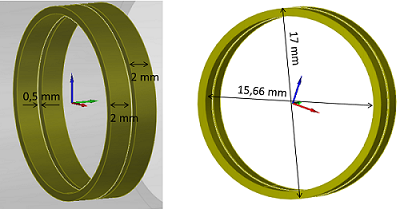 The tubes have an external diameter of 22.22 mm, an internal radius of 9.84 mm, a thickness of 1.27 mm and they measure 50 mm length. 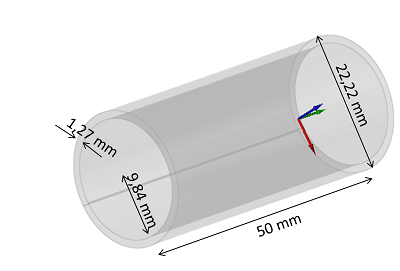 The axial probe is made out of two identical cylindrical coils, with an internal diameter of 15.66 mm, an external diameter of 17 mm and a width of 2 mm. The gap between both coils measures 0.5 mm. The acquisition is carried out at a frequency of 100 kHz in a differential mode. 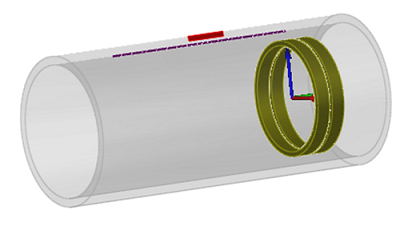 A calibration defect: an external groove at 40 % of the tube thickness, 360 ° around the tube and 1 mm long. 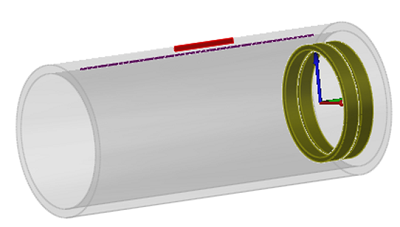 An external and longitudinal notch of 6 mm length, 0.1 mm thickness, and a depth of 52 % of the tube wall. 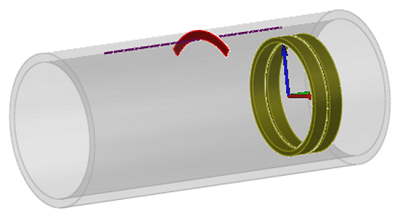 An external and longitudinal notch of 10 mm length, 0.1 mm thickness, and a depth 54 % of the tube. A transverse through wall notch, 82 degrees aperture and 0.1 mm length. For the three studied defects, the Lissajous curves are drawn and the amplitudes, phases, real and imaginary parts as a function of the scanning are represented on the figures below. A good agreement between experiment and simulation is observed. Then, the amplitude and phase values are gathered in a table and the difference between acquisitions and CIVA simulations are calculated. The low discrepancies values confirm the good agreement between CIVA and experiments. 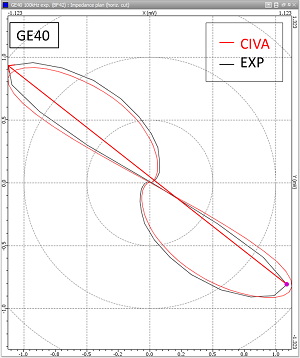 But first of all, simulated and experimental Lissajous curves related to the calibration defect are superimposed her below. CIVA/Experiment superimposition for the calibration defect which is the 40% external groove. 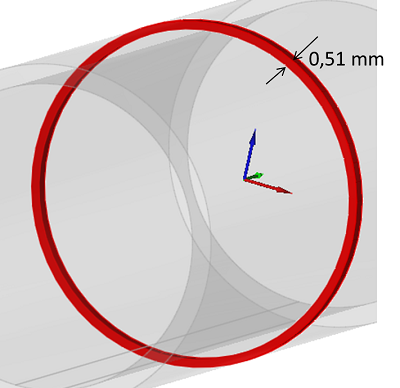 CIVA/Experiment superimposition for the longitudinal notch of 6 mm length. Left handside: Lissajous curve, right handside from the top to the bottom: real part, imaginary part, amplitude and phase. 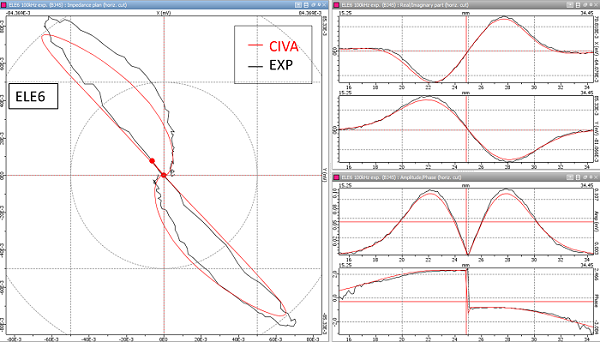 CIVA/Experiment comparison of amplitude and phase values for the longitudinal notch of 6 mm length. 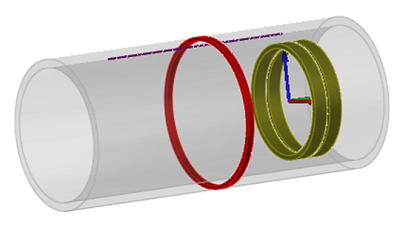 CIVA/Experiment superimposition for the longitudinal notch of 10 mm length. Left handside: Lissajous curve, right handside from the top to the bottom: real part, imaginary part, amplitude and phase. 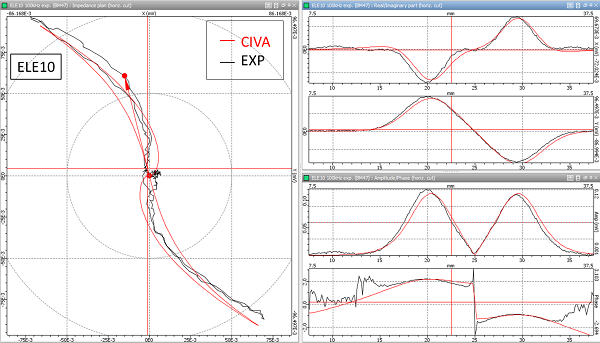 CIVA/Experiment comparison of amplitude and phase values for the longitudinal notch of 10 mm length. CIVA/Experiment superimposition for the transversal through wall notch. Left handside: Lissajous curve, right handside from the top to the bottom: real part, imaginary part, amplitude and phase. 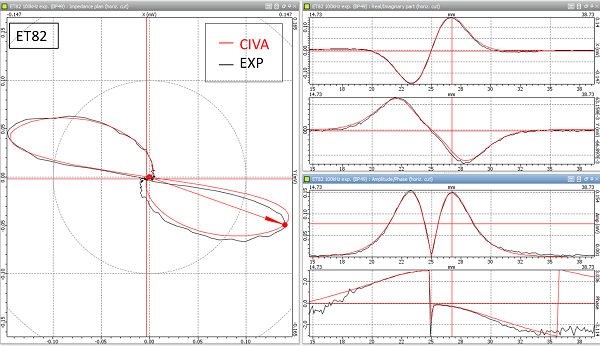 CIVA/Experiment comparison of amplitude and phase values for the A transversal through wall notch.